Where do I even start with The Hunger Games? I picked this book up at the store after hearing some buzz on the internet. I wasn't sure of the premise or if I would find it enjoyable at all. I was so wrong. I devoured this book, I could not put it down. The world that Ms. Collins created was realistic enough that I felt a part of it. There are so many pieces to this story that unfold page after page. This book will terrify you while you are reading and keep you thinking every time you close it. I think I ran the emotional line as I read this. I was sad, angry, frustrated, terrified, and even a little happy when Peeta was around. I was recommending this book to everyone I could once I started reading it. I even gave it as a gift once or twice. If you haven't gotten the chance to read this series yet, don't waste anymore time. Go out there and get this book...and you might as well pick up Catching Fire and Mockingjay as well because you won't want to stop reading once you start. Katniss Everdeen, a sixteen year old living in what used to be the USA, feeds her family by sneaking into the forbidden woods with her friend Gale. The two hunt game, fish, and glean fruit, veggies, and herbs. They eat the food but they also use it to barter for basic necessities. Katniss and Gale live in the poverty-stricken District 12, one of the areas surrounding the country of Panem's capitol. Although there isn't a romantic connection, Katniss knows that deep down she has tender feelings for Gale. Time is approaching for the dreaded "reaping," a drawing each person who is between twelve and eighteen must enter. If your name is drawn, you become a tribute -- a contestant in the deadly Hunger Games, a nationwide televised reality game show in which 24 tributes fight to the bloody death. The last survivor wins the Games. Katniss is horrified when her beloved little sister, Prim, is chosen as a tribute; she immediately offers to replace her. As Katniss is readied to appear on the show, she knows that she is heading off to almost certain death. The other tribute from District 12 is Peeta Mellark, the baker's son. Peeta is not Katniss's friend, but he once did her an incredible kindness. Now she knows she will have to be his murderer, since the point of the Hunger Games is "kill or be killed." But will Katniss survive long enough to be a contender? The thought-provoking THE HUNGER GAMES, with its sly commentary on our evolving society, is not to be missed. Katniss is someone easy to relate to; her adventures are breathlessly plotted, making this book a true page-turner, nearly impossible to put down. My friend insisted I read it, claiming it will be the next Harry Potter phenomenon. I agree. If you only have time to read one book this season, this is the one I recommend. I liked it better when it was called "Battle Royale" (an older japanese movie) or The Long Walk by Stephen King (1975). Collins seems to have ripped off the idea and gotten away with it, but the writing style is very slow. I am no a fan of this book, and I won't read Book 2. Based on a good idea. But that's all. Many of you have either heard of or have seen the blockbuster movies based on these books. I personally read the books firsts. These books are amazing! Katniss Everdeen is a sixteen-year-old girl who lives with her mother, sister Primrose and best friend Gale in a poverty stricken town known as District 12. Twelve districts make up the dystopian nation of Panem, all of which must sacrifice two tributes, one male and one female, to The Capital's Hunger Games. These games are a bloody televised competition filled with death traps and teenagers brutally killing each other til only one remain. This lone survivor is crown The Victor which entitles their district to much-needed supplies. Peeta Mellark and Primrose are drawn as Tributes but Katniss volunteers to take her place for her sister. Katniss is a strong young girl who manages to use all her skills and wit to survive the horrors of The Hunger Games. In order to survive, she must convince the world that she and Peeta are star-crossed lovers in order for them both to survive. However, this act ignites a rebellion that Katniss never could have foreseen. Furthermore, she becomes the face of this rebellion, becoming known as The Mockingjay. I love Katniss as a character! I think she is strong, determined and stays true to herself throughout her changing world. Though there is a love triangle between Katniss and the two male leads Peeta and Gale she isn't consumed by this. Instead, she puts it aside and shows little interest, realising she has bigger priorities such as surviving The Capital's wrath. This was a really nice change compared to other young adult novels where the love triangle is the main focus and the characters are always worrying about it. Instead, the rebellion is the main focus, especially in the second and third books. I personally liked the books more than the movies as they went into more details about everything. I do recommend seeing the movies, though! Just read the books first. I really enjoyed this novel. It is compelling and shows more than you think it does. It's not just a YA novel - its a critique on reality too. Katniss is epic and Peeta was a sweetheart. Gale can go away please. Plot was incredible and very fastpaced. Writing was elementary and simple to read. I love this book. It's so quick paced and easy to read. I love Katniss. She is the character I connect with most of any books I've read. She's the reluctant hero. She loves her little sister, Prim, more than anything in the world and would do anything for her. She's a survivor. Katniss had to become the means of food for her family when her father died in a mining accident and her mother went through some serious depression. She had to grow up faster than a normal kid would but she isn't bitter. She is strong inside and out. She's not afraid to break the rules if she has to. When she volunteered for her sister all she thought was to save her life, not about anything else. It's touching. I love what she did for Rue, the small, sweet little girl from District 11, how she sang for her and placed all those wildflowers around her. She is caring. I'm glad I decided to read this book again, it's simply breathtaking and so wonderfully written. I'd recommend this book to anyone. This book will remain one of my favorites forever. We all have, at some point, learned or heard about a dystopian world. It is patently the opposite of utopia, where life is all good and in proper order. Dystopia focuses on what becomes of our world when the inhabitants have taken less care of the environment. It is commonly imagined as a place where everything is in a repugnant state and cruel totalitarianism is practiced. 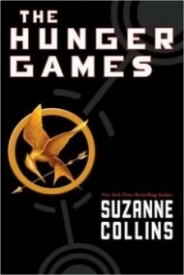 Suzanne Collins's The Hunger Games, which is the first book in The Hunger Games trilogy, is set in a dystopian world called Panem, the post-apocalyptic equivalent of North America. It is a country that consists of an affluent Capitol with surrounding twelve districts—District One being the most prestigious, District Twelve being the least. Back in the days, the thirteenth district sparked up a rebellion against the Capitol that resulted in its own destruction and the creation of the annual Hunger Games, where each district is required to send one boy and one girl to fight to their deaths in live television. It is the Capitol's way of reminding the districts of their power and grace. When sixteen-year-old Katniss Everdeen's little sister, Prim, is randomly drawn to become District Twelve's female tribute for the Games, Katniss volunteers to take her place. Then, alongside District Twelve's male tribute, Peeta Mellark, Katniss is forced into the ever changing arena to fight bigger and stronger tributes from other districts and be the last one standing. One of the things that I truly admire about The Hunger Games is Katniss's character. For a sixteen-year-old, she is a pretty strong woman who knows how to survive on her own. Years of hunting and providing for her family has sculpted her into this young woman that possesses an impressive vast range of capabilities. She is warmhearted, compassionate, and quick-witted. But what I like the most about Katniss is her keen interest in food. It's really nice to read scenes in the book where the characters are eating their meal, and Katniss will constantly comment about how delicious the food is, how much she's putting on her plate, and so on. Perhaps my most favorite is when she will tear a chunk of roll and she'll dunk it in hot chocolate before she eats it—it is one of the things she learned from observing Peeta. Katniss and Peeta are like the walking and talking Yin and Yang. I like how they contrast each other's personalities, and yet, they balance one another effectively. Peeta mellows Katniss out, considering that she's the "sullen and hostile" one between the two, while Katniss sharpens Peeta. She encourages him to believe in his own potential, in his own strength, when he doesn't seem to trust in himself. The other thing that I like about The Hunger Games is the two tributes from District Two: Cato and Clove. There is this one particular scene that I really like solely because of the aforementioned tributes: the scene of the feast. Katniss's face is about to get sliced by one of Clove's sharp knives, but Thresh suddenly appears out of nowhere and grabs Clove off of Katniss. When the reality of Thresh about to slam a rock the size of a loaf of bread against her skull finally settles in, Clove cries out Cato's name in sheer panic. Katniss describes Cato's screams as pained, especially when he apparently spots Clove lifeless on the ground. She witnesses the moment when Cato kneels beside Clove as he begs her to stay with him. Collins may not have emphatically highlighted the two's relationship other than that they are from the same district and are both part of the Careers alliance, but the small interaction between the District Two tributes in that specific scene sort of transmits a message to me that, although they seem menacing and vicious and lethal in the arena, Cato and Clove still somewhat have something soft within them. They have something that makes them human, still. The book has romance, of course, but it's not much of a bother that it makes you want to change your mind about the story completely. As far as recommending the book, if you are someone who is really into dystopian worlds and blood and young love in times of life and death, you may want to pick this up—that is if you haven't read it yet. But who hasn't read the book anyway? Ever since the movie came out, the books have hit the shelves like a raging storm. The Hunger Games is another one of those 'Fight-to-the-death' books. Though some may see it as cliche, I do not know one person who dislikes this book. Enticing and inspirational, it has a great plot and is a genuinely fantastically written book. With the annual Hunger Games - where youngsters are stuck in a dome and have to fight until one person is left alive - comes Katniss, who volunteers to save her sister and take her place. The rest of the book will be left to you to read! I always recommend this book to my friends and family. Such a great, gripping story! When I read this the first time I was not ready for it to be as big and intense at it was. And, it was even more so the second time I read it! I loved the harsh world we are brought in to, the loving characters we meet, and even the terrible things that happen. They make Katniss the perfect girl for others to look for in their struggles. I LOVED this book so much, despite how much it made my heart hurt due to the raw emotions it brings up in readers. Every chapter is just amazing. There's nothing dull about the story, it's really well written and easily understood. I really like how every time a chapter ends, there's either a shocking surprise or a cliffhanger. Katniss is so inspiring even if sometimes when she's clueless or in shock. The story isn't just about the hunger games but from family, love, friends as well as surving with lost loved ones. The reason i gave 4/5 stars for characters and writing style is not because i don't like it but it's because sometimes the characters make decisions or say stuff that i just don't agree with. Sometimes i would be like 'no!! why are you doing this'. Overall this book has made me nearly in tears twice...maybe more but it touched me. he series consumed me. I couldn't put the books down, I hardly slept and when I did, I had nightmwres that I was in the hunger games myself. The long term effect of war and political games on children is so devastating that it made this fictional post-apocalyptical world completely real to me. My sleep-patterns are better now, but I wish the series hadn't ended. PS I was really disappointed when I learnt that the movie will be PG13 - I can't see how it will do it justice.